Baby Led Weaning Recipes | Simple, adaptable finger food recipes for your blw journey. Simple, adaptable finger food recipes for your blw journey. Why choose baby led weaning? Having read up on weaning in the months before my daughter reached the magic six months milestone, we decided that ‘baby led weaning’ (blw) was going to work better for us than going down the traditional puréeing route. Regardless of whether the conclusions of the research are right, baby led weaning is lots of fun for both you and your baby. We’re three months into our eating expedition now and have found a fair few staple recipes, cheats and short-cuts to make life much easier. We’re looking forward to sharing some of these with you on this blog. These little sausages are both tasty and extremely nutritious and surprisingly contain no ‘filler’ ingredients. They are flavoured with fruity dried apricot and orange zest and sophisticated fennel and tarragon. The pine nuts are FULL of all kinds of fantastic vitamins and minerals. Put all the ingredients except the mince into a blender and process until very finely chopped. In a mixing bowl, mix the mince, fennel mixture and black pepper together thoroughly. Taking ping-pong ball sized lumps (or a little smaller), form the mixture into sausages (or little patties if you prefer). 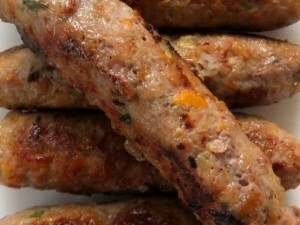 Fry the sausages on a low heat, turning regularly, until golden brown and cooked through. These can be frozen after they have been fried. This is the third of three sandwich fillers promised to the Baby Led Weaning Recipes’ Facebook fans. Easy and quick is the order of the day and there’s not much easier than this. Both avocado and tuna are excellent, nutritious foods for your baby (and you). This spread can be frozen very effectively and you can even pre-prepare and freeze whole sandwiches for additional convenience. Mash the tuna and avocado together. Mix in the fresh herbs. Bob’s your uncle! These are so quick and easy and incredibly tasty. You won’t be able to resist eating them yourself so make plenty! The measures given below make about 20 tiny nuggets. Be prepared to double up next time if the first batch disappears too quickly. You could easily make this gluten/wheat free by using alternatives for the flour and breadcrumbs. The breadcrumbs can also be replaced by quinoa flakes. For a dairy free version, replace the butter with coconut oil. Slice the chicken across the grain into manageable sized pieces and coat the liberally with flour. Melt the butter over a low heat. Add the garlic and heat very gently while you quickly batch prepare the nuggets. 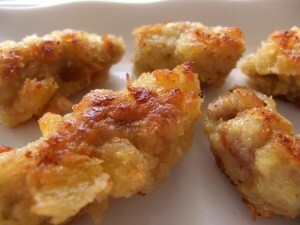 Have your dishes of beaten eggs and breadcrumbs ready and dip about five bits of floury chicken at a time, first into the egg (make sure each is well coated) then into the breadcrumbs (press the breadcrumbs onto the eggy chicken) then pop into the pan of butter and garlic. Repeat until all the breadcrumbed chicken is in the pan. Continue cooking on a low heat for about 10 minutes until the chicken is cooked and the breadcrumbs are golden. Here’s the second of three sandwich fillings, as voted for on our Facebook page. This one’s quick and easy and a favourite staple in this house. Quantities are flexible depending on your babies’ tastes. If they like delicate flavours use mainly cream cheese, if they like fruit then make sure there’s plenty added, if – like mine – they like blow-your-head-off flavours then use plenty of strong cheddar and consider swapping out the fruit for spring onions! Simply grate some cheese into a bowl (we like strong cheddar here; there were no gateway cheeses in this house, we went straight onto the hard stuff). Add a big dollop of cream cheese, and some fruit – grated or chopped up small. Try apples or pears (these are best grated), satsumas, pineapple, or grapes. Mix well and use as a toast topper or sandwich spread. This unlikely combination is a highly versatile freezer staple. Freeze it into cubes and microwave whenever you need a regular purée, toast topper, sandwich filling, or sauce base. Beans are incredibly nutritious and you would do well to increase their consumption across the whole family. Mum included! Mix in some chopped spring onions to liven this up for serving to grown-ups or babies over one that appreciate strong flavours. More info on serving onions to babies (new window/tab). Try it topped with cress and other salad bits to make a ‘garden’ for older children. Some things get chomped on successfully without any trouble at all (peach halves for example) whilst others won’t get eaten unless they’re already in manageable sized pieces (baby rice cakes). Every baby is different so experiment with how you offer food types. Add your personal favourites in the comments. What quick and easy foods does your baby like to eat? This one is only for babies that are definitely not allergic to eggs. If there are no allergies in your family you should be fine giving your baby well cooked egg. If there are allergies in your family there are precautions you should take. The British Allergy Foundation provides excellent guidelines for weaning babies. Using a low heat, melt the butter in a small frying pan and add the mushrooms. Fry gently until softened (3-5 minutes). Add the egg and give a quick stir to evenly distribute the mushroom. Once the omelette has set, turn it over to colour the top side. Make sure that the egg is well cooked, without colouring it too much (which is why a low heat is crucial). Cool the omelette and cut it into small strips to serve it to your baby.